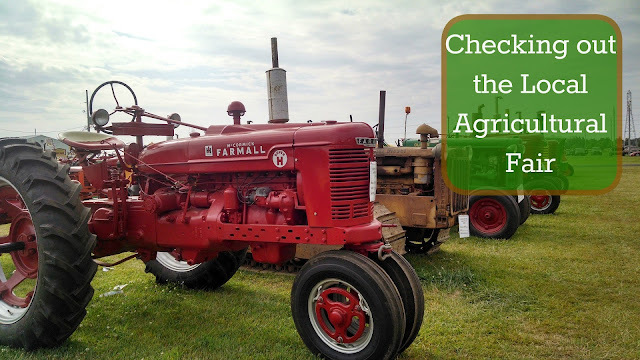 A local town puts on a large agricultural fair each year for labor day weekend and the boys just love it. My husband and I, not so much, but we decided to just get it over with. We were there less than 30 minutes and decided it was just too hot to stay. We were miserable and sweaty and all just wanted to jump in the lake to cool off. So we came home and did just that. The boys swam in the lake, rode the jet ski, jumped off the bridge, used the rope swing and swam, and swam and swam. We headed back into the fair around dinnertime as the sun was going down and the air was cooling and we had a much better time. In fact, we stayed for almost 4 hours. They rode a bunch of rides, and ate a bunch of junk food. But they learned a lot too. We got to make butter from heavy cream, taste maple cream, and a new breed of apple. They got to see a bunch of animals like chickens, rabbits and sheep of all sizes, shapes and colors that local people had entered into the fair. They saw baby chicks that were only 1-2 days old, and got to hold and pet them. They even watched some newly hatching from their shells. Alec spent 10 minutes at a booth reading all about beavers and beaver dams (we finally took a packet home for him to continue reading so we could move on to another booth). He saw a magazine about wildlife that he now has on his Christmas wish list. We saw a booth of taxidermy wildlife like bobcats, fishers, owls, birds and ducks set up by the Audubon society that the boys were very interested in and found a packet of local events they sponsor. We saw a 4- h booth and discovered it's for boys and girls with tons of activities we'll definitely be looking into. It was a wonderful learning venue loaded with fun.